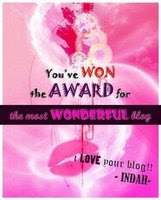 This award I received from my new blogger friend in Indonesia.Tak begitu banyak yang aku tahu tentang dia ni.But one thing that I know is that this friend of mine will always be visiting me at my blog! Just to say hi and hello! Kepada sahabatku, terima kasih di atas pemberian award ini! Moga persahabatan yang baru terjalin ini akan berpanjangan, insya-allah! 2. I am the 4th of five siblings. 3. Have 2 elder sisters, 1 elder brother and and one younger brother. 4. All my sisters and brothers are married now! 5. Lost my mother 3 years ago! Al-Fatihah! 6. I have 7 nephews and 1 niece. 8. I enjoy outdoor activities. 9. I love eating out with my friends and my family. 10. I have been in the education line for 13 years now. Now, I want to tag this people! 1. 1st insert this badge or the pic above to inform you have been awarded. 2. Make sure u take the pic n said who it is from. their names in your blog. 5. Don't forget to go to their blog and tell them they have been tagged !! !